CHILDREN at a Kilburn school will say an emotional farewell to a long-serving headmistress tomorrow (Friday). Valerie Robertson left St Eugene de Mazenod Primary School in Quex Road in February after 30 years – 27 of those as head. 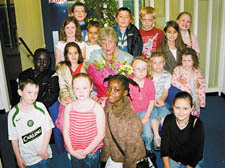 She was recently invited back to help the school celebrate its 40th anniversary with a fun day, where youngsters presented her with a bouquet of flowers. Tomorrow the school is holding a mass and reception service at Sacred Heart Church, which will be taken by the diocese’s vicar general Monsignor Seamus O’Boyle, a former pupil.